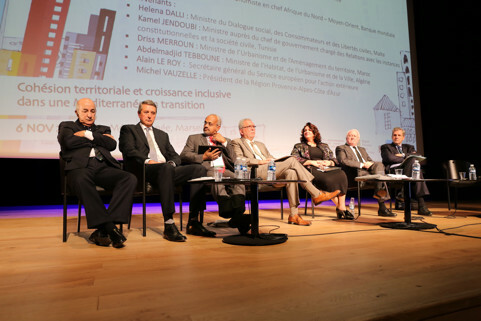 At the initiative of the Center for Mediterranean Integration (CMI) and the Provence-Alpes-Côte d’Azur (PACA) Region, as part of the Mediterranean Economic Week, 6 November 2015 was solely dedicated to finding solutions to reduce inequality in the Mediterranean. Gouvernments change but sub-national entities are emerging, with local influence that gives them power”, explains Patrick Allem and, First Vice-President of the PACA Region, responsible for international relations in Europe and the Euroregion. “Excessive inequality and exclusion is a threat to peace and social harmony”, explains Mourad Ezzine, Director of the Center for Mediterranean Integration (CMI). This belief was expressed by representatives of all the Mediterranean countries present at the event. However, the notion of inequality differs greatly from one region to another. Helena Dalli, Minister for Social Dialogue, Consumer Affairs and Civil Liberties in Malta, explains that the size of their isl and allows for an egalitarian approach. “Our government promotes transparency, resulting in the greater involvement of citizens”. In Tunisia, the fight against inequality is led by a strong trade union presence. “Trade unions do not simply fight for the material and moral interests of their members, but have real national significance”, explains Kamel Jendoubi, Government Minister, responsible for relations with constitutional bodies and Tunisian civil society. Alain Le Roy, Secretary General of the European External Action Service, considers that the fight against inequality must be waged at European level, reminding listeners that “the European Union is very involved in fighting inequality, particularly on a financial level.” He took the opportunity to remind listeners that the fourth edition of the World Forum for Democracy will take place on 18 November 2015, where European neighbourhood policy will be reviewed.